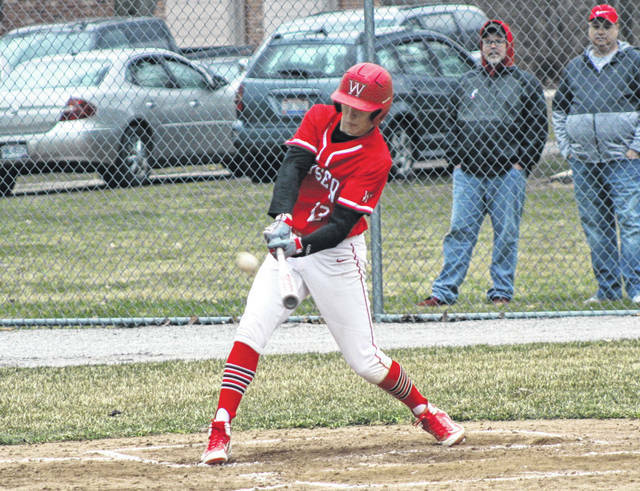 Wauseon’s Trent Armstrong hammers a triple to center field scoring a run during a non-league battle against Pettisville Friday. The Indians bested the Blackbirds 16-3 in five innings. Logan Rufenacht of Pettisville sacrifices a runner to second base in the bottom of the first inning Friday versus Wauseon. 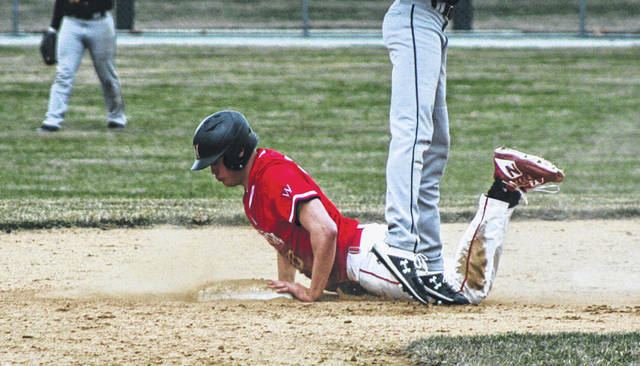 Sean Brock of Wauseon gets dirty while stealing second in the top of the third inning. He had a hit, two walks, and two runs scored for the Indians. 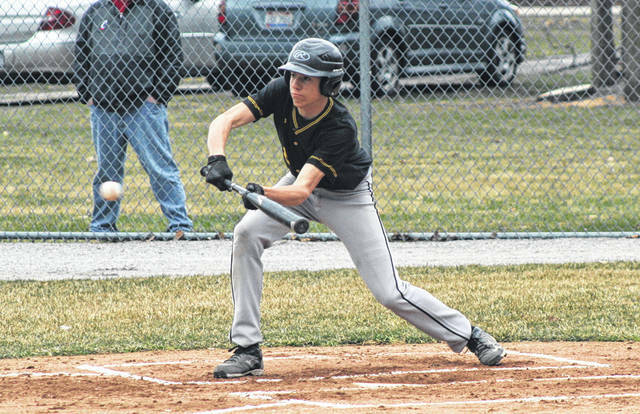 Wauseon turned around an early three-run deficit, wearing out four different Pettisville pitchers in what ended up being a 16-3 five-inning win in non-league baseball action Friday on the road. However, the Blackbirds did strike first, notching three runs in the bottom of the first inning. Josh Horning was hit by a pitch to begin the inning. He was sacrificed to second by Logan Rufenacht. Nate Keim followed with a single, then stole second. The bases would be loaded after a walk to Jake King, leading to Devin Beltz’ RBI single and a 1-0 Blackbird lead. They went up 3-0 on Josh Norr’s fielder’s choice when the attempt to turn a double play at first missed its target. Wauseon cut it to 3-1 in the next half inning thanks to a Brady Thomas sacrifice fly which scored Trent Armstrong. They then took over the lead in the third. Jameson Gray singled to right, stole second and got to third on a catcher misfire. He later scored on Sam Krasula’s ground out. Sean Brock followed with a walk, stole second and moved to third on a wild pitch, coming home on Joe Shema’s RBI single to knot the score. They took the lead on Armstrong’s RBI triple over the center fielder’s head to make it a 5-3 game. For Pettisville, Beltz and Knorr reached with two outs in the home half of the third. They both moved into scoring position on a wild pitch, however, Thomas got out of it with a strikeout of Gideon Myers. Wauseon would add to its lead in the top of the fourth. Thomas doubled to lead it off, and after Connar Penrod’s single he scored on a wild pitch. Sam Krasula was then hit by a pitch as Wauseon had runners at the corners. He stole second, allowing Penrod to score on the throw to second, extending their lead to 7-3. An error at first base by the Blackbirds led to a run by Sam Krasula, making it 8-3. Errors, walks and hit batters led to an eight-run fifth by the Indians to help them end the game early. In the middle of the inning with two runs in already, Levi Krasula was hit by a pitch and both Armstrong and Easton Delgado walked – all with the bases loaded – leading to three more runs. Then, a throwing error on a ball hit to third by Cody Figy plated a pair to give the Indians a 15-3 lead. Thomas’ RBI ground out closed the scoring. He earned the win on the mound, allowing three runs on four hits with five strikeouts and three walks. Thomas (1 for 3) had three RBIs and scored two runs as well. Horning took the loss for Pettisville. Keim, King and Norr finished the outing for the Birds, each pitching less than an inning. Beltz paced the Blackbird offense, going 3 for 3 with an RBI. Wauseon is at Patrick Henry to begin NWOAL play Monday, then the Indians visit Otsego on Tuesday. Pettisville hosts Holgate Monday and travels to Swanton Tuesday.